The tax benefit we are discussing is called the “QSBS exclusion,” which is shorthand for a provision in Section 1202 of the Internal Revenue Code (IRC). This section of the IRC outlines rules that potentially let you exclude from federal taxation the entire gain on the sale of Qualified Small Business Stock (QSBS). This exclusion was enacted in 1993 with a 50% limit, but recent updates to the Code have expanded it to a 100% gain exclusion. Note that the exclusion is limited to gains of $10 million, or 10 times the basis of your initial investment, whichever is greater. If your gains exceed those limits, you will not be able to exclude all of your gains from federal taxation; however, the allowable exclusion is still likely to be quite meaningful in nearly all cases. you are a non-corporate taxpayer. We often advise clients to think about these provisions if and when they are initiating a startup or small business investment. To qualify for the QSBS exclusion, investors will need a business that is properly structured at inception, and they will need to plan for a multiyear investment. An additional note for those seeking to use this exclusion: Tracking which shares qualify for this benefit can be complicated because stock certificates and investor reporting rarely list this information—another reason why working closely with your tax advisors along the way can be key. Your advisors may also help you amend returns (up to three years past) to take advantage of a qualifying QSBS exclusion that you did not initially leverage. The QSBS exclusion is most commonly applied in situations when an entrepreneur sells his or her company, or when investors in a private equity fund receive an in-kind distribution of post-IPO shares after a portfolio company in the fund goes public. * To be clear, there are many dimensions to this rule, and to any small business owner’s situation. We frequently work with our clients and their tax advisors to develop plans that make sense for each client. Here are a few wrinkles to keep in mind that may play a central role in your specific situation. If your exit falls within the five-year window, you can still qualify if you roll your investment into another qualified small business. Another section of the IRC, Sec. 1045, governs this planning step, which is accordingly called a “1045 rollover” in planning parlance. This topic warrants a more detailed discussion, but you could, for example, own QSBS stock in ABC Corp. for two years, then roll that investment over into QSBS stock in XYZ Corp. In this scenario, your holding period for XYZ is, in reality, one day. 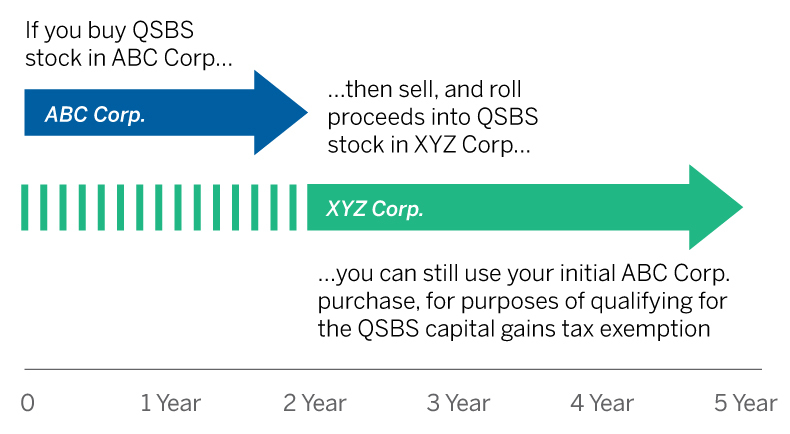 But for purposes of determining eligibility for the QSBS exemption, the holding period for XYZ is considered to be two years (i.e., the period dating back to your original purchase of ABC stock). If you further hold that XYZ stock for an additional three years, then it will be treated as if you held it for a five year term, and thus you will be eligible for the QSBS exemption. The QSBS tax exemption requires you to hold the stock for five years, but if you sell within that window and roll the proceeds into another QSBS investment, the "clock keeps ticking"―in other words, your initial purchase date is still valid for purposes of reaching that five-year threshold. You still benefit from the exclusion in a stock-for-stock reorganization with a non-qualifying business. Even if you exchange your QSBS stock for “non-qualified” stock (for example, stock from a large public company in an acquisition), you may still be able to benefit from your “earned” QSBS gain exclusion down the line. For example, let’s say you’ve owned qualifying stock in Startup Co. for seven years, and your basis is $1 million. Your stock is acquired by Large Public Co. (Large Public Co. does not qualify as QSBS) in a stock-for-stock transaction equal to $7 million in Large Public Co.’s stock. Your $6 million gain qualifies for QSBS exclusion. Twelve months later, your stake in Large Public Co. increases another $2 million in value, and you sell your stake for $9 million. Of your total capital gain of $8 million, you can exclude $6 million from federal taxes. Hopefully, this brief explanation of the QSBS exclusion rules is helpful for entrepreneurs and other small-business investors. When you initiate a startup or small business investment, it is important to consider your options with regard to business structure, and the availability of this exclusion should be one factor among many that guide your decision. And of course, no investment of this type should be made primarily for its tax benefits; the paramount considerations should be the merits of the underlying business, its potential for success, and whether the associated risk is acceptable given your circumstances. But with a moderate amount of planning and forethought, the QSBS exclusion can be a powerful tool for extracting maximum value from a startup or small business venture. *Private equity funds and other private investments are for qualified purchasers and accredited investors.